KANSAS CITY, Kan. — One hundred and eighty. That’s the number of volunteers helping women learn, improve, engage and become empowered through the Keeler Women’s Center here. A ministry of the Benedictine Sisters of Atchison, the center relies on volunteers to provide a wide array of classes, services and support. The center is considered a hidden jewel of Wyandotte County, but its services extend far beyond the neighborhood. “Keeler Women’s Center is for all women in every walk of life,” said Sister Bridget. “We all need to be empowered or have the ability to empower. The classes available at the center are as eclectic as the people you’ll find roaming its welcoming halls. “The nice thing about Keeler is that there are so many partners we work with,” said Pat Callaghan, who joined the board 15 years ago when the center was first established. A member of St. Patrick Parish in Kansas City, Kansas, and a Master Food Volunteer for Kansas State University, Callahan teaches a nutrition class at the center and facilitates the writer’s group. “It’s a reflection of the Benedictines and their care for people,” said volunteer Alice Munninghoff, a member of St. Thomas More Parish in Kansas City, Missouri. Munninghoff knows the Benedictine charism of hospitality well; her own sister is a member of the order. In 2012, Munninghoff retired from 32 years in Catholic education at Notre Dame de Sion High School for Girls in Kansas City, Missouri — 22 of those years as its president. Now she volunteers in the center’s office one afternoon each week. Here she finds everything she loved about her former position, minus the stress. Fellow volunteer Debbie Carmody is a product of Benedictine education through high school. A parishioner at St. Joseph, Shawnee, Carmody worked in religious education programming for Good Shepherd Parish, Shawnee, for 28 years. Now she embraces the Benedictine way of hospitality by helping make the Keeler Women’s Center a friendly environment. In addition to answering the phone, Carmody makes sure the hospitality table is well stocked and ready to welcome visitors. Carmody knows the minute a visitor steps off the elevator that whether she’s a business executive, a Myanmar refugee or a young woman recently released from prison, she’s part of the community here. Counseling is one of the key components of support at the center. This school year, Gabe Rickard is in the process of learning about the individual and group counseling available here. Keeler Center is her practicum placement as she works on her master’s in social work through the University of Kansas. “The counseling they provide here is so needed,” she said. “And it seems like they do a good job of resourcing professionals from outside. She is most impressed by the considerate treatment of clients. “I was a case manager in Chicago and this is not how it was there,” she said. “No hospitality. That’s what drew Jackie Tiggs to volunteer her time at the center. A member of Holy Cross Parish in Overland Park, Tiggs is a retired professional counselor licensed in both Kansas and Missouri. She has been offering her services free of charge at the center for four years now. “It’s part of what I’m called to do,” she said. “It’s a skill I have, and I not only want to share it, I need to share it. Tiggs sees anywhere from eight to twelve clients a week and runs a support group for caregivers. “It is extremely important,” she said of the service she provides. “Sometimes, people are asked to get reports when working with the courts and those are very expensive — they can’t afford it. “Many times, there are marital issues, there’s depression, there’s anxiety, there’s work stress, parenting issues. One of the center’s greatest assets is being able to partner with outside agencies. Sinead McDonough, an advocacy and outreach specialist with the Metropolitan Organization to Counter Sexual Assault (MOCSA), has a support group for Spanish-speaking survivors of sexual assault at the center. A member of St. Thomas More Parish, McDonough appreciates the safe, calm environment that welcomes her group members each week. “If they didn’t feel safe coming forward to a group and disclosing a sexual assault,” she said, “they wouldn’t come to my group. 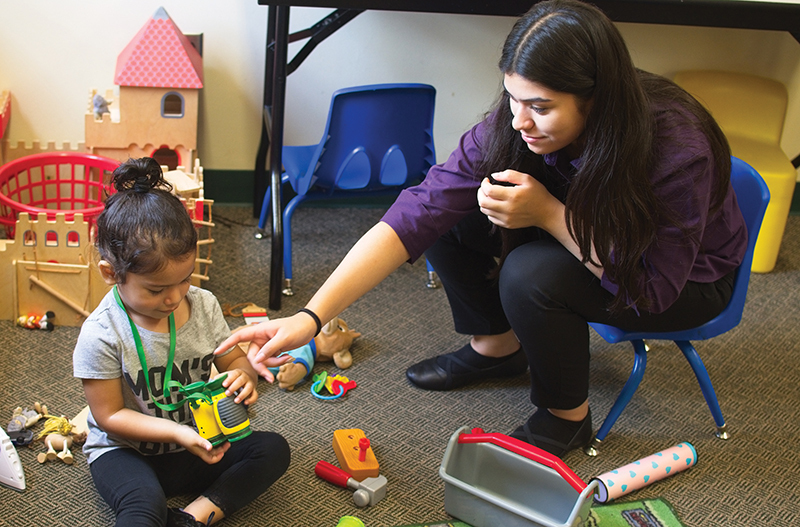 Alondra Estrada, a student of Cristo Rey High School in Kansas City, Missouri, has felt that support as she has just begun a work study job one day a week at Keeler Women’s Center. A member of All Saints Parish in Kansas City, Kansas, Estrada sets out fresh flowers every morning — a hallmark of the Keeler center — and helps out during the day, setting up for classes and sometimes doing child care. “I like what they’re doing here,” she said. “They have different kinds of classes throughout the day and it’s a safe place for everyone. The classes offered through Keeler Women’s Center cover an array of topics — from technology and parenting, to nutrition and knitting. The center is always eager to consider new topics of interest. Peg Burns Kerbawy, a parishioner of St. Francis Xavier Parish in Kansas City, Missouri, came on board three years ago with a curriculum she had developed for teaching Gospel nonviolence. The answer was “yes,”’ and the group expanded to four sessions and beyond. The topic eventually evolved into listening to the retreats of Father Emmanuel McCarthy, the foremost authority on Gospel nonviolence. Linda Barker is involved in transforming lives also, by helping women improve their English. She’s been involved in Keeler Women’s Center for five years. Barker is a fan of the whole Keeler Center approach, in fact. “It’s a haven for women,” she said. “Whether they’re coming to perfect a skill like English, or working on counseling, or the social aspect of doing the knitting or the book club. Lidia Gonzales, a parishioner of the Cathedral of St. Peter in Kansas City, Kansas, knows the value of that interaction. When she came to the center five years ago, she was looking for support as she grieved for her father and brother who had recently died. An immigrant from Mexico, Gonzales spoke no English. But the welcoming atmosphere of the center easily crossed that language barrier. “They helped me a lot,” she said. “I came to get counseling. She told me life continues. “I worked in the book with writing and reading [English]and practiced conversation. Gonzales speaks almost perfect English now and has a good job as a result of the skills she acquired at the center. Volunteers are important to the Keeler Women’s Center, but so are participants. “We seem to be the best-kept secret in Wyandotte County,” said Sister Bridget. “We just wish we had more people to attend our programs — anyone can come. “Come and visit,” added Munninghoff, “Look at the classes that are available, look at the services offered.